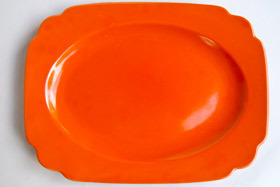 Circa 1936-1942: The Riviera platter comes in an abundant variety of shapes and sizes. 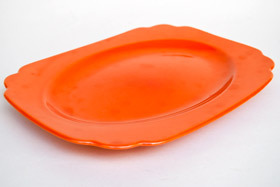 This example is referred to as the "Oval Well Plain" platter. These will be found mostly in eleven inch varities although a few rare large version examples may surface once and awhile. The platters were formed in a ram press, fired once, hand dipped in glazes and placed on stilts in the kiln for a second firing. An extremely labor intensive pottery making technique that would only last into the 30s and early 40s. 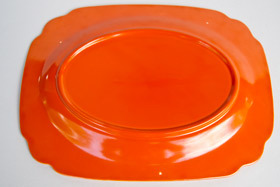 The Homer Laughlin "red" glaze would contain traces of uranium during this time, which would in turn raise it's production and consumer cost. On the tails of the great depression pennies were pinched and slightly less red Homer Laughlin pottery was both manufactured or purchased. 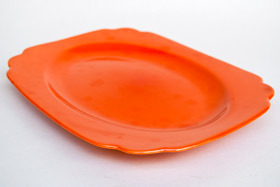 Collectors of vintage solid color dinnerware will cherish the red pieces they are able to add to their collections. This example measures 11 3/4" and is in excellent condition.